If you’re currently seeking a new pickup truck, then you surely can’t-do better than any of the current Ram offerings. These various pickup trucks are some of the most impressive vehicles in the entire industry, much less the class. They deliver all of the amenities and capabilities that a driver would expect from these types of vehicles, including unmatched power. 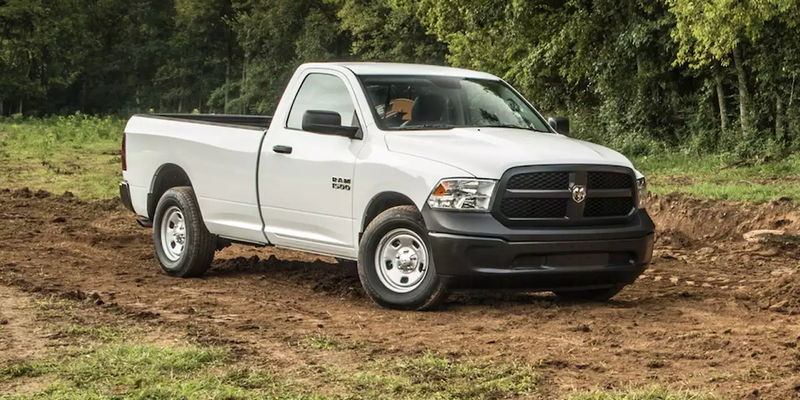 While this particular variation of the Ram pickup may be the “smallest” of the offerings, that doesn’t mean the vehicle still can’t deliver a superb driving experience. Thanks to the array of interior amenities that are included in the 2017 Ram 1500, customers can rest easy knowing they made the proper choice. For instance, the interior is highlighted by the UConnect 8.4 system, which is accessible via the 8.4-inch touchscreen unit. Thanks to this technological inclusion, drivers can access an array of useful applications, whether it be radio (via the available SiriusXM satellite subscription) or navigation (including the intuitive 3-D terrain maps). Plus, thanks to the Hands-Free Calling capabilities, owners can always stay connected without having to compromise safety. That’s not the only technological amenity that’s included in the 2017 Ram 1500. Drivers will also have access to the Driver Information Digital Cluster, which delivers a host of useful info right in front of the truck’s operator. Easily viewable via the seven-inch color display, drivers will never have to strain their neck as they’re looking to view vehicle diagnostics, fuel economy, or speed. Topped off by wood accents throughout the cabin and several hidden storage spots, customers will be hard-pressed to find a more impressive interior elsewhere. This version of the Ram pickup truck truly earns its “heavy duty” moniker thanks to the array of engine offerings. Each of these units is capable of delivering the utmost power, leading to some of the most impressive performance specs in the entire class. The 5.7-liter HEMI V8 engine may be the smallest of the brand’s offerings, but customers certainly shouldn’t underestimate this particular unit. After all, this system is still capable of banging out 393 horsepower and 400 pound-feet of torque, which should be more than enough muscle to overcome any of your fellow drivers on the highway. Plus, thanks to these incredible numbers, drivers can also anticipate a 13,890-pound towing capacity. Next on the list is the 6.4-liter HEMI V8 engine, which takes those various power specs to a whole new level. Drivers can ultimately expect the system to crank out a best-in-class 410 horsepower and 429 pound-feet of torque, resulting in a 16,320-pound towing capacity. Finally, the most hulking offering is the 6.7-liter Cummins Turbo Diesel I6 engine, which delivers 370 horsepower and an awe-inspiring 800 pound-feet of torque. This predictably has various influences on the accompanying performance specs, as owners can expect a 17,980-pound towing capacity and a 3,160-pound payload. These units can be accompanied by the incredibly smooth six-speed manual transmission or the six-speed automatic transmission. When all is said and done, drivers won’t be able to find a better driving experience from a rival pickup. The 2017 Ram 3500HD is generally pretty similar to the 2500HD when it comes to engine performance. However, when you consider all of the power that the pickup truck is capable of pumping out, you’ll surely want the vehicle to provide some type of safety functions. Fortunately, that won’t be a concern with this version of the Ram, as drivers and passengers can remain secure as they’re traveling in the rugged truck. For starters, the vehicle is equipped with an extensive airbag system, meaning occupants can receive the utmost cushion when they find themselves in a collision. The pickup truck’s rugged steel frame will also play a significant role in keeping occupants safe, as the vehicle’s body shouldn’t compromise during any type of crash. Of course, the vehicle also includes a number of features that should help drivers avoid accidents in the first place. For instance, the Electronic Stability Control system will assure that the driver is remaining on their intended path, while the Speed Control will promise optimal handling when traveling on the highway. Drivers can even opt for the ParkView Rear Back-Up Camera or the accompanying ParkSense Rear Park Assist System, which will surely reduce any avoidable fender benders. Now that you’ve determined that a Ram pickup is a proper choice, it’s time to start shopping. Well, if you live in the Keene, New Hampshire area, there’s no better place to make that purchase than from Keene Chrysler Dodge Jeep Ram. The dealership is stock full of new and used vehicles, and their convenient hours and an array of services will lead to an unmatched buying experience. Regardless of whether you’re seeking a Ram pickup truck or any other similar vehicles, you’ll surely find them sitting on Keene CDJR’s lot. After all, the dealership is stocked with dozens of new and used vehicles, providing you with plenty of options as you’re shopping around for your next ride. Specifically, customers will have the opportunity to choose from the more than 90 new vehicles that are currently available, including several offerings that are priced south of $22,000. If you prefer a used offering, then you could choose from the nearly 50 pre-owned offerings that are currently sitting on the lot. At the end of the day, regardless of what vehicle you’re pursuing, you’ll surely find it at Keene CDJR. The car-buying process can certainly be a grind, but customers can still expect an optimal experience when they’re buying from Keene CDJR. For starters, these individuals won’t have to shift their schedule around as they’re planning a trip to the premises. Rather, the convenient hours means you’ll always have time to look through the dealership’s vast inventory. The sales department is open seven days a week, including starting at 8 am on Monday through Saturday (11 am on Sundays). The same goes for the business’s expert service department, which is also open at 8 am on Monday through Saturday. While you’d normally have to take time off work to visit a traditional dealership’s lot, that won’t be an issue when it comes to Keene CDJR. Of course, customers won’t only have to rely on Keene CDJR as they’re shopping for their new ride. Rather, they can also lean on the dealership for their array of available services. For starters, the business is willing to finance their customers’ purchase, meaning these individuals won’t have to visit a credit union or bank as they’re looking to secure the necessary line of credit. Furthermore, the service department is in place to handle any of your mechanical issues. Instead of visiting an untrustworthy mechanic, you can simply rely on Keene CDJR’s expert teams of technicians to fix any of your issues.